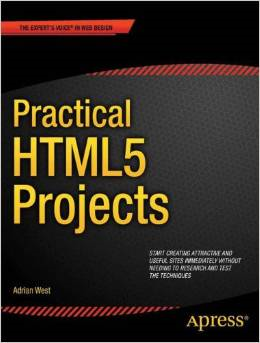 Practical HTML5 Projects. By Adrian W West. The publisher unfortunately insisted on an inappropriate title for this book, I Intended it to be titled Practical Website Tips and Tricks. Most aspects of practical web design are covered, with an emphasis on what makes an attractive and useful website. As the book was printed in May 2012, some items will be a out of date now, but the principles will still be valid. 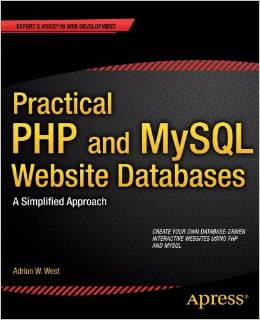 Practical PHP and MySQL Website Databases: A Simplified Approach. By Adrian W West. Learn how to create interactive database driven websites from practical examples. Great Book!! The author Adrian W. West really knows how to teach. I highly recommend this book. NOTE: Three years after the book was published, the book's code and platfoms became obsolete due to the release of PHP5 and a new version of phpmyadmin. As a result a second edition was published. See below. Practical Web Design for Absolute Beginners. By Adrian W West. Escape the straight jacket of colouring-book type programmes such as WordPress and Joomla. Design fast loading unique websites using HTML5 code and CSS styling. 40 short simple practical examples that will put you in total control of your websites. 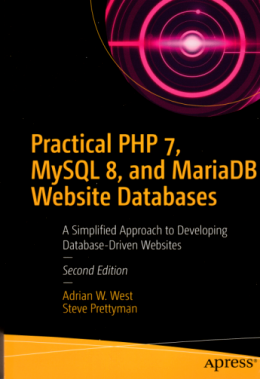 Practical PHP 7, MySql 8, and Maria DB. Second Edition By Adrian W West. This is the second edition that uses the latest versions of PHP amd phpmyadmin. Although its title includes the words "Simplified Approach, it is much more advanced than the frist edition becase it uses prepared statements and a platform called Bootstrap instead of simple CSS.. "